Even though it will be too chilly for the beach and sandcastles, there is alot to do during the off-season in Ocean City Maryland. There are many events to check out during November through the new year. Fallfest of Fine Art November 6 – November 7, 2010 is sure to be a great time featuring fine art painters, sculptors and high craft artisans. Admission is Sat, 10 a.m.-5 p.m. and Sun, 10 a.m.-4 p.m.
Winterfest of Lights November 18 – January 2, 2011 is always a great time as we bring our kids each and every year to see all the lights. Even better yet, Raffles Condo Rental is conveniently located right next to the Winterfest of Lights. Book today and make this a tradition with your family. This is an enjoyable tram car stroll through North side Park on 127th Street where the family will get to enjoy Hot Chocolate, Santa Claus, Decorations, and millions of lights that decorate the entire Park. 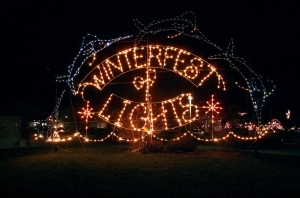 Winterfest of Lights has been named a prestigious Top 100 Event for 2010 and 2011 by American Bus Association. Sunday – Thursday 5:30 p.m. – 9:30 p.m.
Friday & Saturday 5:30 p.m. -10:30 p.m. Admission is $4.00 for those 10 years & older, and FREE for those 9 years and younger. Ocean City Maryland has so much to offer in-season and off-season so book your vacation rental today at www.rentraffles.com and take advantage of some of OCM’s traditions. To see if this condo is available to rent, please check the online calendar and select your desired month from the drop down menu and the click search button.